Here’s another interesting statistics from comScore, this time regarding the behavior of smartphone users. According to the report, smartphone users’ behavior has been changed, whereas before smartphones were used to access email, calendar and contacts while on the go, now more smartphone owners are using their devices as much for personal productivity as for entertainment purposes. Around 74% of smartphone owners are using their mobile devices for personal use. 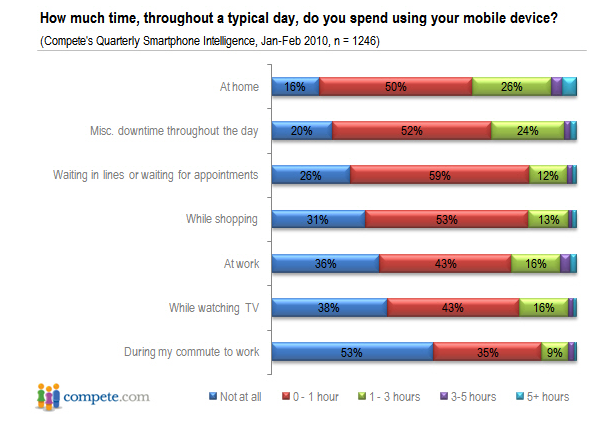 And when asked how much time they spent using their smartphone at various times of the day, the result showed that smartphones are being used practically all through out the day. So, what’s the point of these findings? It is definitely very important if you are managing a brand campaign or even if simply running mobile advertisements. This opens up a huge audience base for your product and could result to sales if you can handle it pretty well. But of course, businesses wanting to engage in mobile advertising would want to know how much of these smartphone users will be potential customers. In other words, how perceptive are they with mobile ads. Surprisingly, comScore found out that there are quite a number of smartphone users who are willing to partake of what’s being offered on mobile ads. Smartphone users are more than willing to take on grocery coupons, barcodes that can be scanned by the smartphones, savings offers on consumer products, movie theater offers and more. Given this fact, if you’re planning to take on the mobile ad space for your products, be sure to make your ads engaging enough to merit a click or tap on your link from smartphone users. The mobile ad industry is still young and is bound to grow leaps and bounds in the coming days.